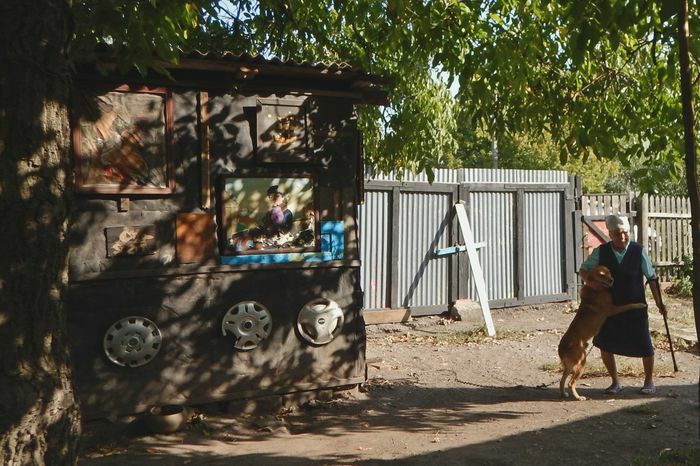 The absence of power is the main problem of Zolote city of Luhansk region. The head of the military-civil administration can’t be appointed there already for 9 months. But after the communication with elderly local residents, the sad conclusion draws by itself: the system interrupted its normal functioning long time ago. Tamara Arkhipova is already 75. Making the excursion through her yard and house, she leans on her wand. Just behind the gate there is a dog shed and a shed decorated with old reproductions of paintings and trophy car disks. While we are looking on the ‘Unknown’ of Ivan Kramskoy, to Aunt Tome, as she is called by local, the dog runs up to her sitting on the chain and standing on the hind legs for a couple of minutes persistently tries to lick her cheek. The woman laughs and says that Baron is 25 years old – incredibly much, as for a dog. Now Tamara Alexandrovna lives in the cottage, but not so long ago an executive committee allocated her an apartment – the preferential turn came. But, it’s impossible to live there. ‘I have a better barn, comparing with such a flat. The gas, light and water – everything is cut off. There are no here is no toilet, there is no bath, no gas stove… Only one box stands. Windows are broken, doors are broken, all in a web…‘. Moreover she was forced to write a statement that she got flat, after she was deleted from the queue on the real estate. ‘I’m a brawler for them. But I even didn’t make a scandal, if I’d do they would be sorry that they were born! – Aunt Tonya cheers cheerfully, but for a split second he starts to sob and starts to sob. – But I do not want. I have no health for this…’. The real stock of coal and wood is needed to heat a house, that’s why woman is going to remove to flat in winter. But just in case she decided to repair the stove in the house – she found a stove-maker and paid him 1000 UAH (~$38). For three days of work the man had time to raskrochit an oven, but did not have time to finish it – has washed down. Aunt Toma explains to us in what house your flat is and gives us very precise orientation. You go in the entrance, and there you will see – the most beautiful door. Let the lads take her aside, and you’ll come in. To issue a disability? You all understand perfectly! On the other day there will be 66 years old to Zinaida Goncharova. During 62 years she has serious problems with her hearing – the circumstances of a hard childhood, in which she slept on the floor in stepmother’s house. If she has no hearing aid, there would be practically no sounds in her life. ‘I didn’t want to register a disability. Money is needed. I need to teach my granddaughters. You yourself know perfectly well – any disability is made through money’, Zinaida Petrovna states. 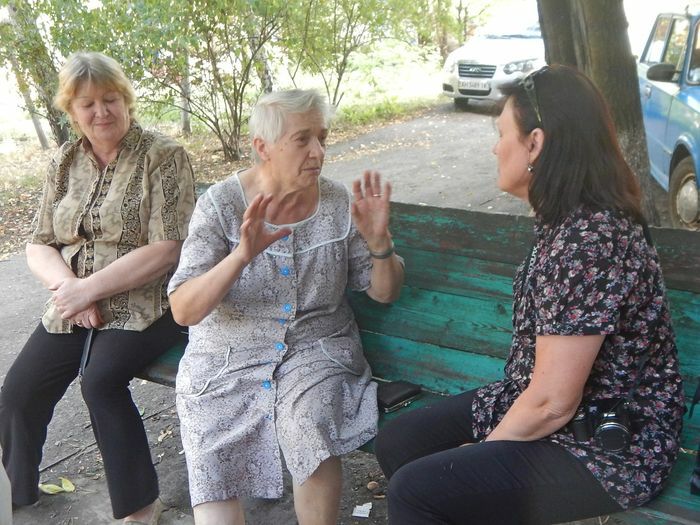 She hasn’t worn new hearing aid, bought for her for 6000 UAH (~$223.55) by ‘Karitas.Kramatorsk’, yet, protects in case of going to hospital because of postoperative problems with her leg. Zinaida Nickolaevna does her best not to apply to doctors. Even when she has 40 degrees temperature, and this happened twice for this year. ‘I’m curing with folk remedies: some I read in newspapers, some I find out from the Internet’, woman explains. 55-year-old Iryna Nickolaevna has alike story. Diabetes mellitus type 2 was diagnosed already in 2011. At the same time, they prescribed Glucophage, which she drank until recently. But the problem was not only in shells, flown above the head. 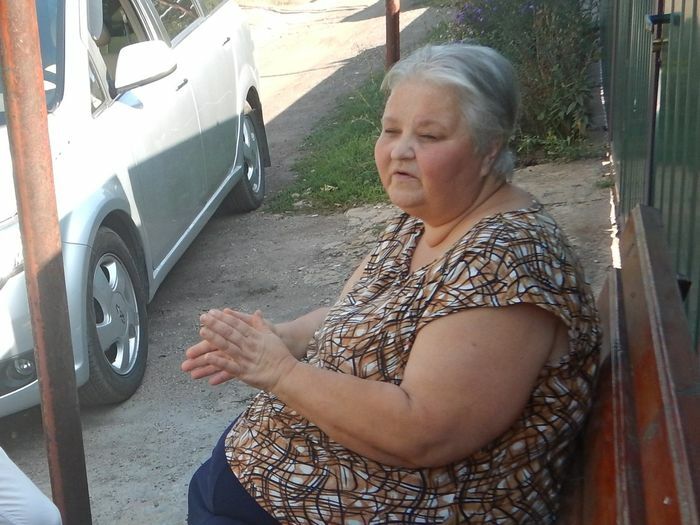 The pensions weren’t paid in Zolote for 6 months and family was forced to ask for help. ‘Somebody told that diabetics could get aid from Akhmetov’. But people from his office answered that ‘It’s not allowed to you’. After that we didn’t want to apply to somewhere, we didn’t expect help from anywhere’, Iryna Nickolaevna said with hurt. But need forced to. One humanitarian organization refused in the food set to family, because three children of an employment age are registered in the house. Really, only one son lives with parents. He works as an underground electrician in local mine. His wage is 3000 UAH (~$111.77) a month and they’re paid with delay of 2-3 months. ‘We do our best in our vegetable garden. We eat a lot of them’, the woman explains the principles of surviving in the front line settlements. Not so long ago one finger, and then the other were amputated from Iryna Nickolaevna’s leg. ‘The finger was amputated because in diabetes mellitus the leg vessels are clogged and the bone begins to rot. It all started with the appearance of a watermark on the finger, as if she had rubbed her shoes. No redness, no pain. A week later I started swelling, I went to the hospital, and then they puzzled me: ‘Your bone is rotting’. Sergei Mikhailovich, the head of the surgical department in Ivano-Frankivsk, made an operation to woman. ‘We have a surgeon here, but we both of different views… – Iryna Nickolaevna sighs. – He is an old-fashioned person. Doctors from the Central and Western Ukraine are coming to us – they have more developed medical sphere there. I’m very thankful to Sergei Mikhailovich, he does his best to help’. Antibiotic, prescribed by a doctor, was managed to be found only in Kyiv. ‘I bring ampoules to the manipulation room, and there they ask: ‘And what is this?’ – the woman retorts indignantly. – Then the nurse learned everything from the doctor, I was pricked, and immediately it became easier’. After the operation Iryna Nickolaevna’s husband applied to ICRC to help to buy glucometer. They refused there but finally registered them. The international organization hasn’t found yet for two months this device, prices for which fluctuate between several hundred and several thousand hryvnias. ‘Anyway ‘Karitas’ gave it to me, but I’ll refused if they bring it’, Zolote inhabitant assures. ‘I don’t have disability! It’s not allowed. Even now they said to me: ‘You can do it by yourself. Maybe you will get it. You will need to be in a Severodonetsk hospital. And how can I do it?! We have one pension for two persons with husband and I can’t work’. Zinaida Dolenko is 67 years old. She worked all life as a welder at the Popasnyansky car-repair plant and because of the harmfulness of work in the foundry, retired in 50 years. Her husband as well as her daughter died when they were 38 years old. ‘The daughter died two months ago. High sugar and chondrosis were diagnosed, and then it turned out that the inflammation of the brain’, the woman sobs. She permanently comes back her daughter at a present time category: ‘Today they sent her to hospital and this evening she died. Before that they cured her from chondrosis during two weeks’. The house in which she lives was bought in 1998. The roof began to lea after the shellings, but woman has no funds to repair it. Without the garden on which she works, despite the stroke and partial paralysis, there would not even be enough pension to go shopping for groceries. 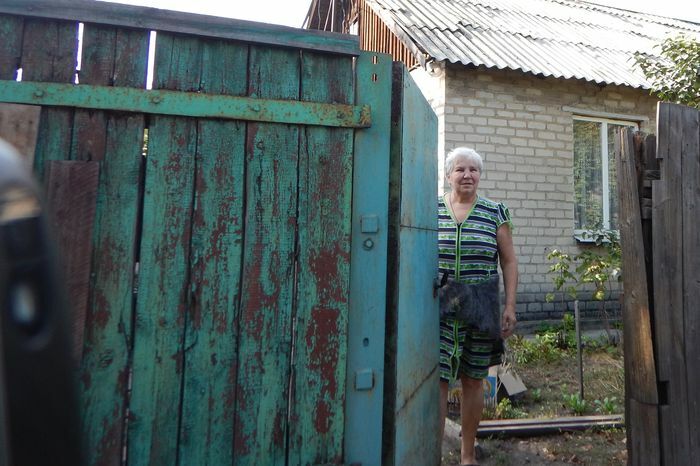 76-years-old Rosa Tikhonovna has been living in Zolote more than 40 years. Against the background of other elderly people, she stands out with cheerfulness and smiling. ‘I sing in ‘Nadezhda’ (Hope) chorus: we sing Ukrainian as well as Russian songs. I have Ukrainian mother and father was Kursk nightingale. We have men in chorus too, but a little bit. One boy died not so long ago. He came to sing very seldom and two brothers – one accordionist, and the second sorts of jokes tells to music’, she says with laugh. ‘I didn’t like it here at all… I was crying for Donetsk for two years. But my husband convinced me to stay. I 40 years here. All grandchildren live in Donetsk now’. Woman doesn’t complain on the problems with health, but she has a typical problem of elderly people – loneliness. ‘My husband died in 2013, on November 6. And daughter – on November 16. She was only 56. She got married in 15 and I was grandma in 35. I cried and couldn’t find a place for myself. I still can’t find it. – through tears Rosa Tikhonovna speaks, but quickly takes itself in hands and laughing asks – What do you want to hear?’.